Low-cycle fatigue resulting from plastic deformation near a hole showing the logarithm of lifetime in terms of number of cycles together with a stress-strain curve for the first few load cycles. When structures are subjected to repeated loading and unloading due to material fatigue, they can fail at loads below the static limit. 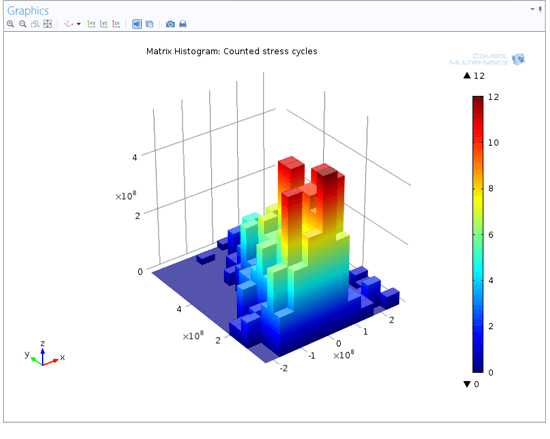 A virtual fatigue analysis can be performed in the COMSOL Multiphysics environment with the Fatigue Module, an add-on to the Structural Mechanics Module, which contains a collection of fatigue models. The applicability of each model depends on factors such as material and loading type. The classical stress- and strain-life methods relate a stress or strain amplitude to a fatigue lifetime. Together with the stress-based and the strain-based critical plane methods, you can evaluate the high-cycle and low-cycle fatigue regime. In applications involving nonlinear materials, you can use energy-based methods or Coffin-Manson type models to simulate thermal fatigue. When dealing with variable loads, the accumulated damage can be calculated from the load history and the fatigue limit. 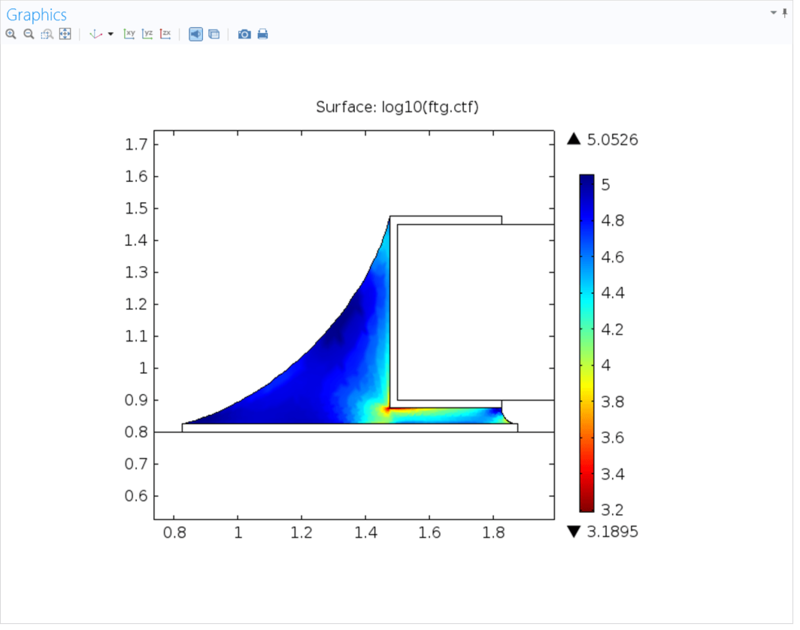 The fatigue load cycle can be simulated in solid bodies, plates, shells, multibodies, applications involving thermal stress and deformation, and even on piezoelectric devices. In order to improve computational efficiency when dealing with subsurface or surface initiated fatigue, a fatigue evaluation can be performed on domains, boundaries, lines, and in points. High-cycle fatigue analysis for non-proportional loading using critical plane methods. The distribution of stress cycles at a certain point as computed by the Rainflow counting algorithm using a Matrix Histogram plot. The mean stresses are shown on the horizontal axis and stress amplitudes are shown on the vertical axis. Solder joint in a surface mount resistor. Life prediction based on the dissipated creep energy in one thermal fatigue cycle. When analyzing fatigue through classical methods, the stress or the strain amplitude relates to the fatigue lifetime via a fatigue curve. The stress-life and the strain-life models provide a collection of methods where the fatigue curve can be defined in a variety of ways. These models are suitable for proportional loading when, for example, a single load oscillates between two values. You can address the high-cycle fatigue with the stress-life models containing the classical S-N curve, Basquin model, and an approximate S-N curve. You can make low-cycle fatigue prediction using the strain-life models containing the E-N curve, Coffin-Manson, and Combined Basquin and Coffin-Manson model. Critical plane models search for a plane that is most favorable for crack initiation and propagation where fatigue will take place. These are available in the Fatigue Module for both the stress- and strain-based models. In the high-cycle fatigue domain, where plasticity is very limited, stress-based models are typically used. In the Fatigue Module, they are calculated through the Findley, Normal stress, and Matake criteria, which calculate the fatigue usage factor that is compared to the fatigue limit. Strain-based models evaluate strains or combinations of strains and stresses when defining a critical plane. Once the critical plane is identified, they predict the number of cycles to failure. The Fatigue Module features the Smith-Watson-Topper (SWT), Fatemi-Socie, and Wang-Brown models. These models are usually used in low-cycle fatigue where the strains are large. The Neuber's rule and the Hoffmann-Seeger method are available to approximate the effect of plasticity in a quick linear-elastic simulation. It is also possible to consider a full elastoplastic fatigue cycle when using the Nonlinear Structural Materials Module. The Fatigue Module calculates the number of cycles until failure as well as the fatigue usage factor. In cumulative damage simulations, the stress distribution of the applied random load can be shown together with the relative usage factor. This simulation displays contributions of a specific fatigue load to the overall fatigue usage factor, which in this case is seen as damage. The stress distribution is presented as a function of the stress amplitude and the mean stress. Random loads introduce a variety of stresses with different magnitude into a structure. In the Fatigue Module, the Cumulative Damage analysis not only identifies the overall trends in the stress history, but also calculates the accumulated damage from each of them. The stress history can be evaluated through the principal stress or von Mises stress, with a sign determined by principal or hydrostatic stress. The load history is then processed with the Rainflow counting algorithm, and the damage is calculated using the Palmgren-Miner linear damage rule. The effect of the R-value is incorporated through the limiting S-N curve. When the number of load events is large in a random load analysis, simulation of the load cycle is time-consuming. This can be greatly reduced if the nonlinear effects are not present in the simulation. In that case, the stress cycle can be prescribed with help of superposition, which is selectable in a Cumulative Damage analysis. Utilization of this technique not only saves computational time, but also greatly reduces the size of the model that needs to be stored for fatigue evaluation. Material expansions or contractions due to temperature change introduce stress concentrations and strain accumulations that can lead to failure. The Fatigue Module provides a number of tools to address this through thermal fatigue modeling. 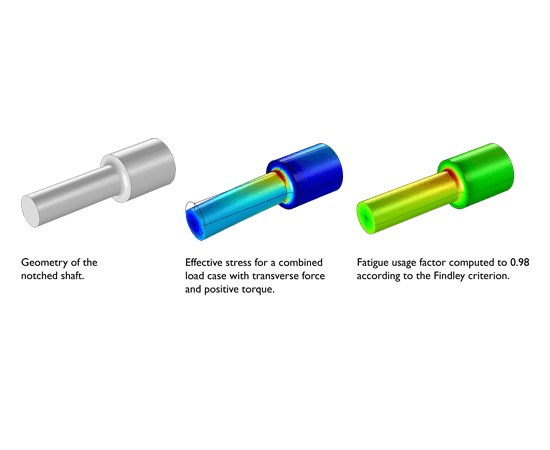 The thermal load cycle can be simulated utilizing the Thermal Stress and the Joule Heating and Thermal Expansion physics interfaces. Thermal fatigue failure can be evaluated using several fatigue models. For nonlinear materials, this includes the Coffin-Manson model and the energy-based Morrow and Darveaux relations. In addition to the available options for inelastic strains or dissipated energies, the fatigue evaluation models can also be modified by the user to evaluate strain or energy expressions when calculating fatigue. COMSOL Multiphysics® es su selección ideal de software para el modelado de aplicaciones mecánicas y la simulación de las distintas físicas que se ven afectadas por ellas. Mecánica Estructural, modelos de materiales no lineales, geomecánica, y ensambles son sólo algunas de las muchas aplicaciones mecánicas se pueden modelar con el software. Debido a que COMSOL utiliza el estándar industrial de método de elementos finitos (FEM), usted es capaz de investigar los numerosos fenómenos físicos que afectan su modelo, como la electromecánica, la interacción acústica-estructura y la interacción fluido-estructura, análisis de contacto térmico y eléctrico, magnetostática, y más. Vea este vídeo para aprender cómo COMSOL Multiphysics puede ayudar a agilizar el proceso de diseño y optimizar sus diseños mecánicos.